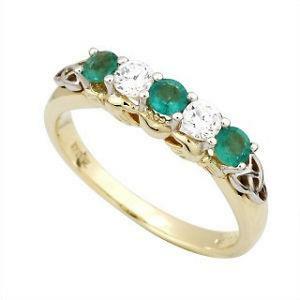 14 ct Diamond and Emerald Claddagh Eternity Ring, A beautiful ring perfect as a Eternity or engagment ring. ID103 Claddagh Weave - Ladies, the ancient symbol of Claddagh, representing Love, Loyalty and Friendship. With the classic eternity knot. 14ct Yellow and White gold. ID104 Passion - Wide, classic Celtic knot represents eternal love; the knot intertwines with itself leaving neither beginning nor end.